Winston Wächter Fine Art is pleased to announce the opening of two exhibitions: Zaria Forman: Ice to Island and Rena Bass Forman: In Memoriam. These exhibitions will present a unique opportunity to view the work of a mother and daughter whose shared interest in documenting the effects of climate change has drawn international attention. Please join us for the opening reception on Wednesday, June 10 from 6 – 8 pm. 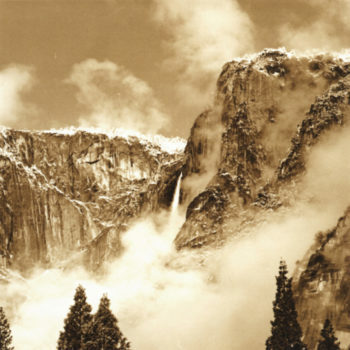 Rena Bass Forman used medium format film to shoot sepia and black and white photographs of majestic landscapes, ruins, and vistas. Her subject matter recalls the work of great nineteenth-century photographers who traveled the world in search of natural wonders and emotionally powerful imagery. Zaria accompanied her mother on voyages to Greenland, Iceland, Patagonia and India, inspiring her own interest in documenting disappearing places. Bass Forman dreamed of following in the footsteps of the nineteenth-century American painter William Bradford with a contemporary expedition to the Arctic but did not live to see her dream fully realized. To honor her mother’s legacy and collect material for her own drawings, Zaria Forman led an expedition up the northwest coast of Greenland. “Documenting climate change, the work addresses the concept of saying goodbye on scales both global and personal. 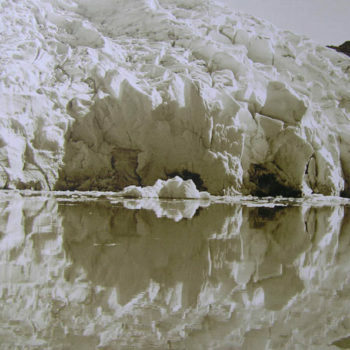 In Greenland, I scattered my mother’s ashes amidst the melting ice.” This exhibition presents a special opportunity to view the artwork of a mother and daughter whose creative output deals with what many call the most critical issue of the 21st century. Zaria Forman’s work is exhibited widely across the United States and is held in the collections of the Arkansas Art Museum and the Frances Young Tang Teaching Museum. Her drawings have been featured by press organizations the world over and appear in the Netflix series House of Cards. Rena Bass Forman’s photographs can be found in the collections of the Cleveland Museum of Art, the Milwaukee Art Museum, the US Embassy in Iceland, Goldman Sachs, Microsoft Art Collection, and the Henry Art Gallery, Seattle, WA.